“We get rid of NAFTA. It’s been a disaster for the United States,” said Trump. (AFP) US President Donald Trump said Saturday he will soon notify Congress that he plans to end the NAFTA agreement with Mexico and Canada in favor of a new regional trade deal, setting up a potential clash on Capitol Hill. That would trigger a six-month waiting period before the US could leave the pact — during that time, US lawmakers would be asked to approve the new deal signed on Friday with America’s neighbors. Trump says the new pact — known in Washington as the US-Mexico-Canada Agreement (USMCA) — will help US workers, especially in the auto industry, and better safeguard intellectual property. “We get rid of NAFTA. It’s been a disaster for the United States,” said Trump, who insisted that the North American Free Trade Agreement, in place for nearly a quarter-century, was a killer of American jobs. “That’ll be terminated so Congress will have a choice of the USMCA or pre-NAFTA, which worked very well,” the Republican president said. 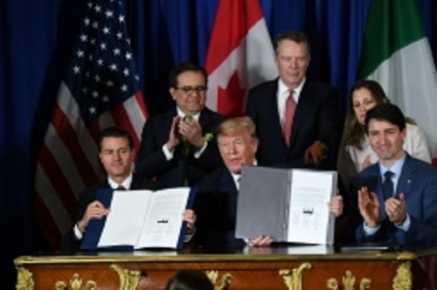 The signing of USMCA was a victory for Trump, following months of tense and difficult negotiations with Ottawa and Mexico City. Trump said Friday that he did not foresee a problem with getting congressional approval, but some Democrats — who will control the US House of Representatives as of January — have expressed skepticism. “What isn’t in it yet are enough enforcement reassurances regarding workers” and the environment, she told a press conference. “This is not something that we have a piece of paper where we can say yes or no to it,” said Pelosi, who added that Mexico had not yet passed a law on wages and working conditions. The new deal also requires legislative approval in Canada and Mexico.